Beyond temporary advances, military activity in Syrian conflict has been not been significant enough to lead one to believe the status quo on the ground may change soon. However, the Syrian Armed Forces have been building up not so quietly both in terms of size and capabilities. Facing desertions, defections, battlefield losses, and poor morale, worsened by ethnic as well as sectarian divisions among personnel (akin to the Sunni-Shi’a divide that still plaques the Iraqi armed forces and the divisions that ruptured the Yugoslav National Army in the 1990s.) To compensate for those losses and difficulties, the Syrian Army has reinforced itself with local militias, and elite troops from allied countries and fighters Shi’a militia groups. Given this build up of its power and the relative weakness of the opposition forces, it might be possible for the Syrian Army to launch a major offensive that would lead to victory for the Assad regime. In 2011, the National Coalition for the Syrian Revolutionary and Opposition Forces, though its political wing, the Syrian National Coalition (SNC) announced its armed struggle uprising against President Bashar al-Assad and his regime. Throughout that summer, its members were engaged in an accelerated mobilization and arms and equipment were amassed. It was not long before arms and equipment began to flow from Turkey, Jordan, and Lebanon to the fighters on the ground, known as the Free Syrian Army. The initial objective of the Syrian Army and security forces at that time was to prevent the SNC from achieving any real success. The Supreme Military Council (SMC), and its force in the field, the FSA, although initially capturing significant amounts of territory and acquiring momentum, was denied control of Aleppo and a foothold on Damascus. Syrian Army units along the border were given the task to hold their positions, they did not receive any significant reinforcement. A number of border positions collapsed and fell into FSA hands. Strongholds were created in villages, towns, and cities in the shape of a band stretching nearly 30 to 60 miles wide at points from west to east across Syria, from the Euphrates River and Lake al-Assad to Abu Kamal on the border with Jordan. A shorter, connected band of FSA controlled territory was established. It stretched from east to west, from the Euphrates, nearly 40 to 50 miles wide, abutting the Turkish border from Jarabulus to Madydan Ikbiz. Just south of that band was Aleppo, into which the FSA penetrated and secured territory. There was also FSA territory in Idlib province which included a lip of land reaching the coast. Further, the FSA secured a smaller territory in Homs province near Ar Rastan down to the Lebanese border west of Qusayr and over to Talkalakh. Lastly, in Damascus province, the FSA gained territory abutting the border with Lebanon northwest of Damascus from Az Zabadani to An Nabk. While the Syrian Opposition wanted regime change, they were not united on many levels. This became most apparent later as they planned the Geneva negotiations in May 2013. At the political level, the SNC and the SMC were at odds not only on negotiations, but on an approach to removing Assad. Initial momentum created enough inertia to drive the FSA to push for greater territory in Syria. 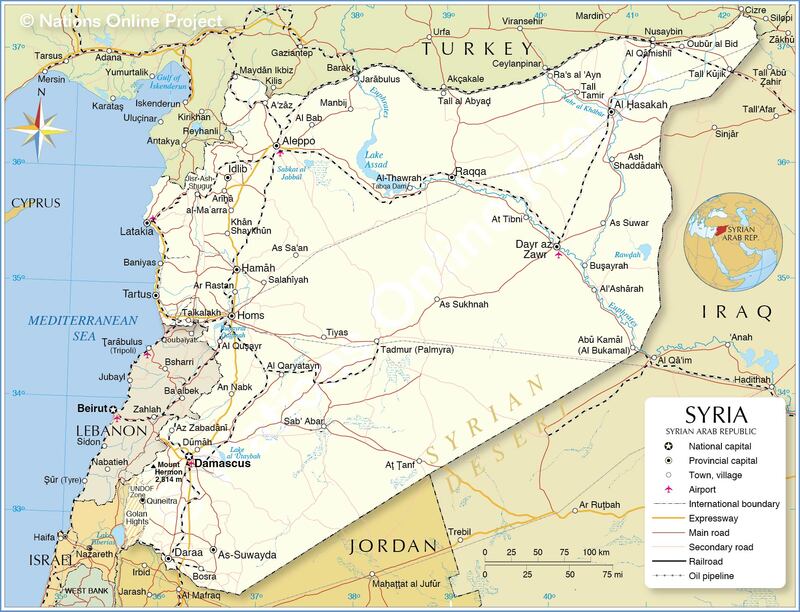 This satisfied the SNC because it gave them control over Syrian territory, renamed and reflagged as “Free Syria” and had the effect of removing Assad’s authority over part of the civilian population. While appearing as a success on the part of the FSA, the reality was that without actually destroying the Syrian Army’s capacity to attack and regain ground, destroy the FSA, or keep the Assad regime in power, they had accomplished little. By establishing strongholds and basing itself in town and villages, the FSA had enabled Syrian Army artillery to daily engage in fire missions using heavy guns, rockets, mortars and tank fire against FSA positions. Syrian Air Force bombed and strafed those positions daily. Further, the FSA, having been mustered together with a curious mix of Syrian retired military, defectors, former reservists, and the movements’ activists, along with Islamic militants and members of the al-Qaida affiliated group, al-Nusra, had some difficulties establishing real cooperation and coordination during operations. The diverse groups at best displayed tolerance toward each other. That situation, along with the fact that the FSA lacked real military power, in terms of fighters, heavy weapons, and the ability to maneuver, meant the force would not likely be able to mount a conventional defense against a potential large scale offensive launched by the Syrian Army and its allies. The Syrian Armed Forces and its allies can stand up a force that currently holds over 200,000 troops including, the rearmed and adviser supported Syrian Army, other ground units of the armed forces, Mukhabarat or intelligence organizations, the police, Shabiha or paramilitaries and street gangs, as well as Hezbollah, the National Defense Forces, a militia, Iranian Revolutionary Guard Corps, Iranian Special Forces or Quds Force, Iraqi Shi’a militia. If an attack were launched, the FSA would very likely face an armored and mechanized assault across a broad front to against the ‘Free Syria territory.” That territory and all lines of communication within it would very likely be cut at five major points in the FSA lines: Abu Kamal, Deir az Zawr, Ar Raqqah, along Lake al-Assad and the Euphrates, and Aleppo. The attacking units would unify, redirect, and be reinforced by Syrian Army units in and around those towns. The objective would then be to encircle defined space including and around those points in FSA territory. The five encirclements would serve as areas of responsibility for commanders in them, yet the encirclements would be linked to each other at specified points. The majority of attacking forces would act as quickly and decisively as possible against the FSA in the encirclements, massing on its strongholds, bases, and training facilities. At the same time, a force of sufficient size and strength would break north, away from each encirclement, toward the Turkish or Jordanian borders, to ensure FSA forces in the encirclements did not receive supplies or reinforcement. Secondary concentric attacks would be made on the edges of the encirclements. All elements of the combat power of the Syrian Armed Forces and its allies would be brought to bare on the FSA in each of the five encirclements. All elements of the FSA infrastructure would likely be removed in the five encirclements. The Syrian security services would very likely attempt to separate the population in the areas from anything connected to the FSA. While attempting to hold on to towns and cities in the encirclements, the FSA would be subjected to the maximum amount of firepower artillery, rockets, mortars, and tanks that the Syrian Army could bring against them. Horribly, the populations of those towns and cities would most likely panic, and chaos and confusion would ensue. Refugees would run from town to town and city to city, increasing the population in each location as they move. That would make mounting a defense at those locations even more difficult for the FSA. As was demonstrated in Qusayr, the FSA is willing to fight to hold down a town knowing the relentless and merciless assaults from the attacking Syrian Army and allied units would terrorize and harm the civilian inhabitants. Those forces sent beyond the five encirclements, toward the borders of Turkey and Jordan soon would become a blocking force to prevent FSA units to escape to safe havens outside of Syria. They would also likely be driven in that direction under hot pursuit of forces in the surrounded areas. They could very well be trapped moving north or west, displaced from their collapsed defenses and become open to artillery and air attacks travelling on roads or in fields. While it is hoped that the Syrian Army does not launch an offensive and the US and Russia will be able to broker a peace agreement, it is also possible that war will continue. If time is not on the Syrian Army’s side, power certainly is. If the SNC and SMC continue to reject the efforts of the US, Russia, the EU, and Arab States to find a peace, they could create a tragic situation of their own making. There is no popular support or political support within the US or EU for a war with Russia or Iran over Syria. If Russia raises the stakes, the US may not be willing to put its own well-being and interests at stake for amateurs, more interested in posturing and positioning for power, as opposed to ending the killing and behaving as the founding fathers, and mothers, of a reforged nation. Assad is the world’s problem, not just the Syrian opposition’s problem. The world will decide how to deal with him and the world is not reliant or guided by the SNC’s or SMC’s actions. The best suggestion would be for the SNC and SMC to hurry to the negotiation table before it is too late! This entry was posted in News Syria, Syria, Uncategorized and tagged Abu Kamal, Aleppo, Ar Raqqah, Arab States, Assad, Bashar al-Assad, Damascus, Deir az Zawr, EU, Euphrates, Free Syria territory, FSA, Hezbollah, Iraqi Armed Forces, Iraqi Shi'a militia, Jordan, Lake al-Assad, Lebanon, National Coalition for the Syrian Revolutionary and Opposition Forces, National Defense Forces, Quds Force, Qusayr, Russia, Shi/a, SMC, SNC, Sunni, Sunni-Shi'a, Supreme Military Council, Syrian Armed Forces, Syrian Army, Turkey, US, Yugoslav National Army by greatcharlie. Bookmark the permalink.